In conjunction with the exhibition Color Space (March 15-30), Visiting Professor Yasmin Vobis will speak about her work at a reception on the evening of Tuesday, March 20 at 6:30pm. 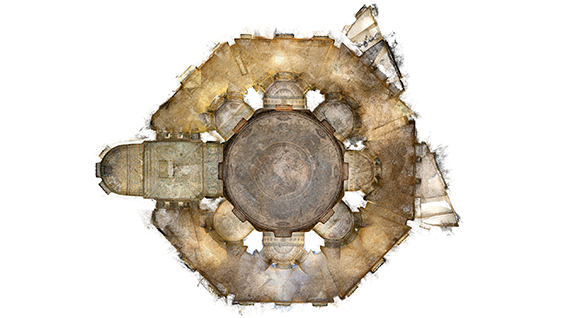 The images presented highlight the process of photogrammetry, which uses sets of complementary photographs to locate color points in space in a digital modeling environment. Relying on the camera as a simple perspective-machine, spatial coordinates and RGB values are combined to produce digital environments that connect color and space in a form of architectural pointillism. Colore is the main protagonist of these environments, while disegno are inferred from the color clouds - presenting an inversion from the typical draftsman's approach to delineating architecture. Such models produce information about color, light and surfaces in three dimensions, rendering precise atmospheres. The works on display were produced during Vobis' time at the American Academy in Rome in the spring of 2017. Her fellowship was made possible by the Founders / Arnold W. Brunner / Katherine Edwards Gordon Rome Prize in Architecture.